Malta is more than just an exotic summer destination. This tiny Mediterranean archipelago offers a life-changing experience that will reward you with unique experiences – fruits of its 9,000-years history and today's multicultural society. The islands welcome visitors with their jaw-dropping architecture, neon-blue sea, unmatched hospitality, and an ever-present laid-back mood. 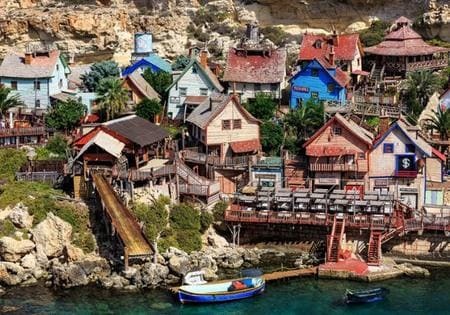 If you want to get the ultimate Maltese experience, you will not want to miss these 20 best things to do in Malta! Malta has a myriad of tourist attractions. 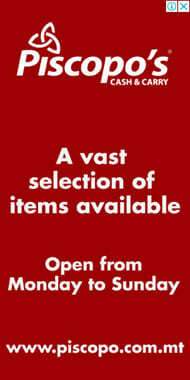 If you attempt to see all of them in a single weekend, you will have a bad, rushed-in experience. So, your ideal choice is to start with a low-paced stroll around the nation’s capital and get the gist of the local atmosphere. The best place to start your Maltese trip is on the fortification walls that surround the capital city Valletta. The Knights of St John built these impressive barricades in the 16th century to defend the island from the Ottomans. Nowadays, they offer a splendid view of the surroundings and of two of the busiest harbors in Europe. If you are still in Valletta, and you want to send the folks back home a nice picture of you enjoying Malta, head to the Upper Barrakka Gardens. This luxurious garden is packed with lush vegetation, red-stone architecture, and refreshing water fountains. The vantage point offers a spectacular panoramic view of the capital, the harbor, and the nearby "Three Cities." Malta is home to some of the earliest maritime ports established in the Mediterranean. Three of these harbors are Birgu, Senglea and the lovely inlet of Cospicua. 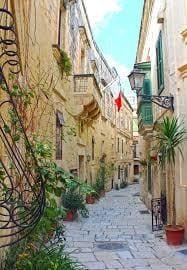 Also known as the “Three Cities,” these small towns are just a short drive from Valletta. A visit here will expose you to a rich cultural experience and charming buildings, some of which date back to the arrival of the Order of Saint John in 1530. After landing on the Maltese shores in the 16th century, the Knights of the Order wanted to leave their mark on the island for centuries to come. In this regard, they made good use of their staggering wealth by building plenty of impressive Christian temples and churches. History buffs will love this part of their trip in Malta. The Lascaris Rooms are a network of tunnels located in the bastion walls of Valletta. The knights built them as living quarters for their slaves, but they gained a more dignified meaning in the Second World War when the ally troops planned here the successful invasion of Sicily in 1943. The exposition features artifacts and devices that the military used during those trying times. 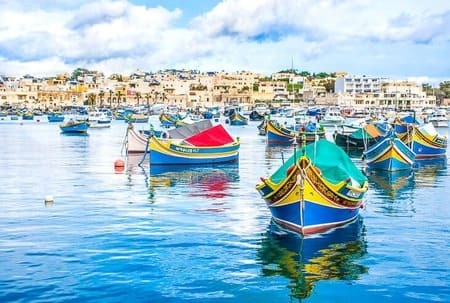 If you want to see authentic Maltese fishermen at work you have to take a full day-trip to Marsaxlokk – a small fishing village on the southeast coast of the main island. Here, you can admire a tiny harbor full of vividly-colored fishing boats that the locals use every day to earn their living. In its rich history, Marsaxlokk has seen several armies landing on its shores, and many wars taking place in its sheltering gulf. However, that has not stopped the local people from continuing a millennia-old fishing tradition that they pass on from one generation to another. The small village is also a great destination if you are looking to eat an authentic fish dish of Maltese cuisine. 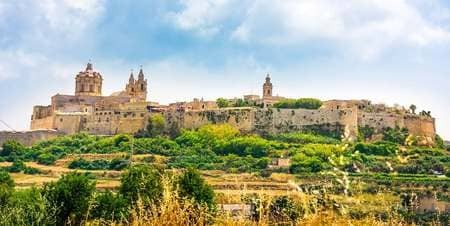 Located in the middle of the main island, Mdina is a fortified citadel that served as the first capital of the people living here ever since the Bronze Age. Every people that settled in this tiny Mediterranean archipelago used this settlement as their headquarters. The Romans, the Arabs, the Christian Knights, and even the English settlers left their mark here. Mdina is one of the few fortified medieval cities in the world that is still inhabited. Walking on its stonewalled streets you can admire the impressive, military architecture of the past centuries. From its top, you can get a wide panoramic vista of the island. 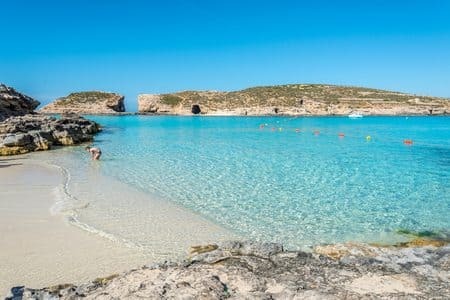 The smallest inhabited island of the Maltese islands is Comino, which is also home to a turquoise haven also known as the Blue Lagoon. 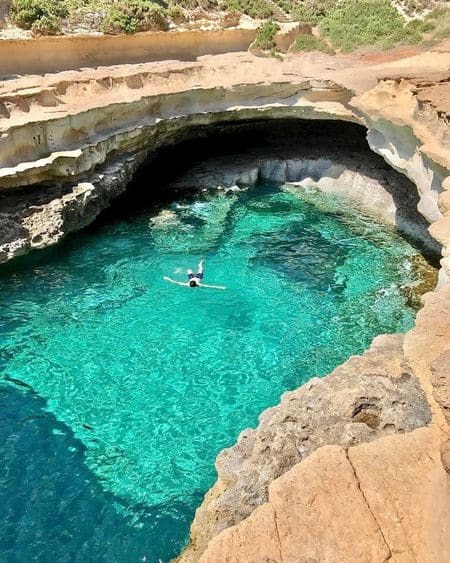 This natural pool of water in the middle of the Mediterranean Sea looks like a paradise for snorkelers, divers and swimmers. You can get there with a ferry from Malta, and spend a full day floating in crystal-clear waters over the gorgeously colored reefs. Thousands of people come every year to Malta solely for diving. The waters surrounding the archipelago act as a hot spot for divers worldwide, regardless of their experience. The area around the islands is renowned for its spectacular underwater landscape. Furthermore, these shores have seen plenty of naval battles over the centuries. Numerous ships have found their resting place on the bottom of the sea, and you can easily book a diving tour to visit the wrecks around Gozo and Comino. The amusement park consists of vividly colored houses, alleys, and docks that were part of the famous movie. This venue is the perfect place to spend a full day of fun games with the family while enjoying short boat rides and tasty dishes of power-boosting spinach. Gozo is the second largest island of the Maltese archipelago. Until 2017, it was renowned for the Azure Window, which eventually collapsed into the sea after millennia of unyielding erosion. Nevertheless, the charming island still features plenty of tourist attractions that you can fit into your trip. One of the things that you should do on Gozo is going to Dwejra Bay. 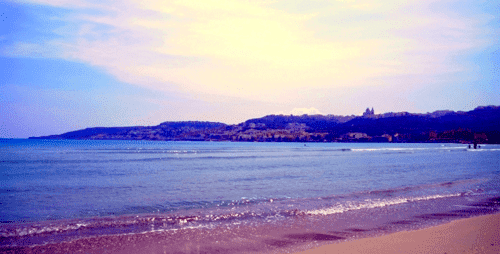 This site is a paradise for people who want to soak the day away in the natural pools of the bay. Here, you can swim and float carelessly in the neon-blue waters for hours without worrying about strong currents or high waves. Malta is home to some of the earliest manmade constructions in the world. One of these precious pieces of preserved history is the Hal Saflieni Hypogeum, which is a system of prehistoric temples and burial grounds sculpted in solid rock dating back to 3600BC. Historians believe that the ancient people used this site to bury their dead and that as many as 7,000 corpses could have fit there. Because this construction, which predates the Egyptian pyramids requires careful preservation only 10 people can visit it at a time. Therefore, you need to book your tickets even before leaving on vacation in Malta. If you have not seen the Pantheon in Rome yet, you can see a similarly impressive construction in Malta. The Rotunda in Mosta is modeled after the famous architectural wonder, and it is not far from its inspirational figure. The church that is dedicated to St. Mary stands 220 feet high and has a wonderfully decorated interior. A fun fact about the Mosta Dome concerns an event from the Second World War. During an aerial attack by the German forces, a bomb broke through the dome’s roof and fell on the floor without exploding. The church was packed with people at the moment as Mass was taking place, and many of the witnesses considered it a miracle. If you are tired of the touristy crowds in Malta, you can take a 20-minute ferry trip to its sister-island Gozo. This small isle features rocky coastlines and remote sandy beaches where you can lay back and bask in the sun. Nature lovers will enjoy trekking and hiking on Gozo, as well as the beautiful architecture of its small villages. When you want to come back from your walk in the countryside, you can stop for a delicious meal in the port city of Victoria, which boasts gorgeous buildings dating back to the Roman and Byzantine periods. Vacation trips in Malta do not have to relate to its historical landmarks only. 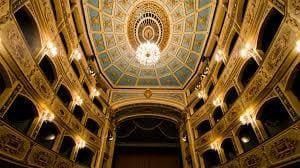 You can also experience a part of its more modern culture by attending an artistic event at the Manoel Theatre. This beautifully-designed venue can sit 623 attendees for opera shows, plays, and even rock concerts. This auditorium is the 3rd oldest working theatre in Europe and a splendid piece of 18th-century architecture. When you tire of walking and admiring the ancient and medieval architecture of Malta it is time to take a much-deserved rest at the beach. Although Malta is well-known for its rocky coastline, you can still bask in the warm sun on the sandy Mellieha beaches. Mellieha is located in the northwestern part of Malta and it features the longest strip of golden sand on the island in Mellieha Bay. This is the ideal spot for getting a nice, long-lasting tan that you can proudly take back to your home country. On weekends, this bay becomes a bit crowded, but you can still find refuge on smaller beaches nearby like the ones at Gnejna Bay, Golden Bay, and Ghajn Tuffieha. If you want to find out more about the arrival of the Order of St John in Malta, you should check this educational exhibition that takes place on the island. This well-organized tour takes you back in time to 1565 when the Knights defended the island against the invading Turks. 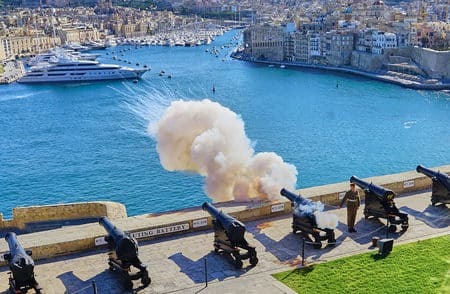 The Great Siege of Malta & the Knights of St. John Tour is a multimedia event that features actors, sound effects, artifacts, and walk-through guides. It is a fun experience for the whole family and a spectacular insight into Maltese history. 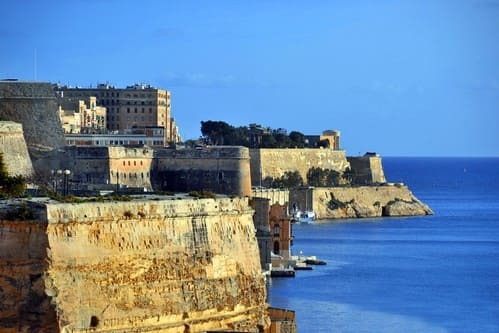 You cannot leave Malta without visiting the southeast part of the island. Here, you will find a laid-back atmosphere and fewer touristy crowds. 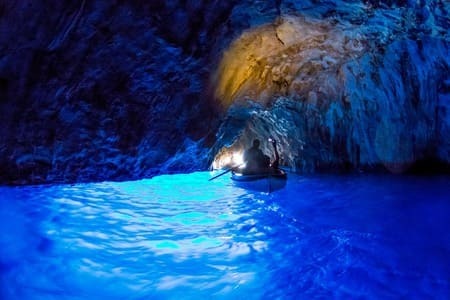 One of the main attractions is the Blue Grotto, which is a natural complex of caves where the water takes on a dazzling blue color. 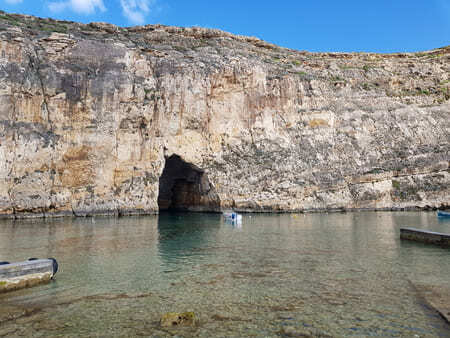 You might have already seen the Blue Grotto in promotional flyers as it features an impressive stone arch that rises 30 meters above the sea right at the entrance. You can book a tour that will take you on a small boat in and around the cave complex. Snorkelers can also practice their favorite hobby in this area. While most of the tourists go to Mellieha for a day at the beach, you can head the opposite way to St. Peter’s Pool located on the eastern coast of the island. Here, the scenic coastline is covered in rocks that you can use for sunbathing or diving. This place is popular among the locals who come here to dive and snorkel far from the touristy crowds. The Maltese gastronomy is rich, tasty and it combines flavors from the versatile cultures of neighboring nations. While visiting Malta you must stop and taste some of the delicious dishes such as Lampuki Pie (a pie made with Lampuki fish), Fentaka (Rabbit Stew), Kapunata, (a Maltese alternative to ratatouille), and Bragioli (Beef stew with olives). Wash them down with a glass of robust Maltese wine or a locally crafted beer to get the full Maltese dining experience.